We have recently created a MEMORIAL UMC PICTORIAL DIRECTORY!!! This Directory is a little different from the directories of the past, because it can be found online at INSTANT CHURCH DIRECTORY as well as through an apps on your smartphone! WHY AN ONLINE DIRECTORY? After much discussion and research, we have decided to use this new approach to a church directory. First, there is no cost to you. The online directory can easily be updated as new members join or address and phone numbers change. You can have the church membership anywhere you have access to your smartphone. PLEASE NOTE: If you DO NOT have a computer or smartphone OR would simply like to have a hard copy version of the latest church directory, please contact the church office and ask for one. We would be glad to print one for you! STEP 1 – EMAIL ADDRESS: Before you are able to create a username/password, you must have an email address on file with the church office. If you do not have an email address on file with the church, or you have any trouble creating a Sign-In account, please contact Susan Frye, Lynda Hepler, or Rodney Denton (336) 472-7718 for assistance. 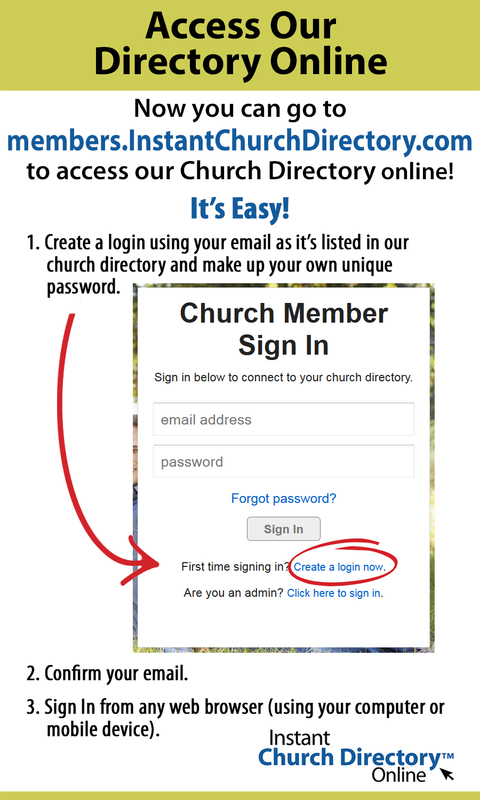 STEP 2 – INSTANT CHURCH DIRECTORY: Go to the INSTANT CHURCH DIRECTORY website found HERE. STEP 3 – CREATE ACCOUNT: You will be asked to enter in your email address as it’s listed in our directory and a password. Once you enter your email address and password, you will be asked to confirm your email address via an email which will be sent to your inbox. In the email will be a link that will direct you to the sign-in page. Enter your email and password on the Sign-In page and then you will be able to search for families and members and see pictures and see phone numbers and addresses right from your computer. Our church directory is also available to view on your mobile device! Instant Church Directory – the program we use to build our church directory – has a free app for church members to download on their Apple, Android and Kindle Fire devices. STEP 1 – EMAIL ADDRESS: Before you are able to create a username/password, you must have an email address on file with the church office. If you do not have an email address on file with the church, or if you have any trouble creating a Sign-In account, please contact Susan Frye, Lynda Hepler or Rodney Denton (336 472-7718 for assistance. STEP 3: FOLLOW THE PROMPTS: You will be asked to enter in your email address as it’s listed in our directory. Once you enter your email address, you will receive a password. You will receive one password per device. For example, you will need to register both your iPhone and your iPad. Entering the password starts the download of the directory to your device, and once it has completed you will be able to search for families and members and call, email and text right from the app. More information can be found at www.InstantChurchDirectory.com/app. If you do not have a photo or your entry is missing, or you need to update your information, please contact the church office (336) 472-7718.